One of the security features that Microsoft provides to keep your information private is the Windows Firewall. 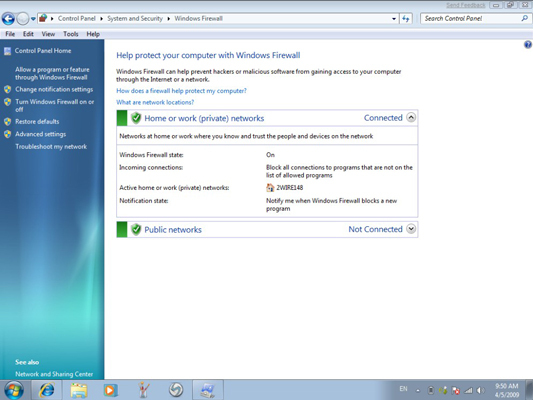 By enabling the Windows Firewall and keeping Windows 7 up to date, you can keep your computer safe from outsiders and avoid several kinds of attacks on your data. The Windows Firewall is designed to keep your computer safe from outsiders by preventing any program from entering or exiting your computer via the Internet. Choose Start→Control Panel→System and Security→Windows Firewall. The Windows Firewall window appears. Click the Turn Windows Firewall On or Off link in the left pane of the window. The Windows Firewall Customize Settings window opens. 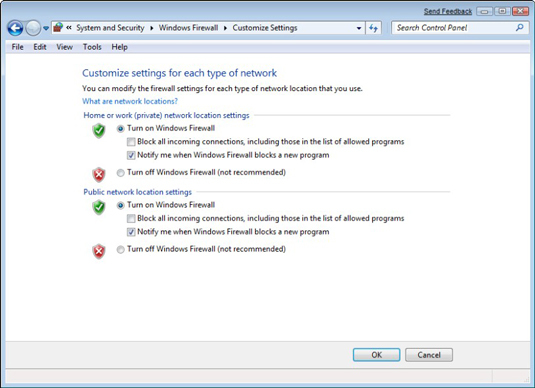 Select the Turn on Windows Firewall radio button for one or both of the network locations. Click OK.
You can choose to impose a different level of security on each of the network types: Home or Work (Private) Network Location Settings and Public Network Location Settings. Click the Close button to close Windows Security Center and the Control Panel. Firewalls are an essential part of your Windows security system unless you use a Virtual Private Network (VPN). If you use a VPN, the firewall will prevent you from sharing files among other VPN features. Many antivirus and security software programs may offer their own firewall protection. Compare the features of different firewall programs. Most firewall features are comparable. The important thing is to have one activated.